For the first time World Land Trust (WLT) is funding a team of rangers at Three Giants Biological Station in the Chaco-Pantanal Reserve, which is owned and managed by WLT’s partner Guyra Paraguay. 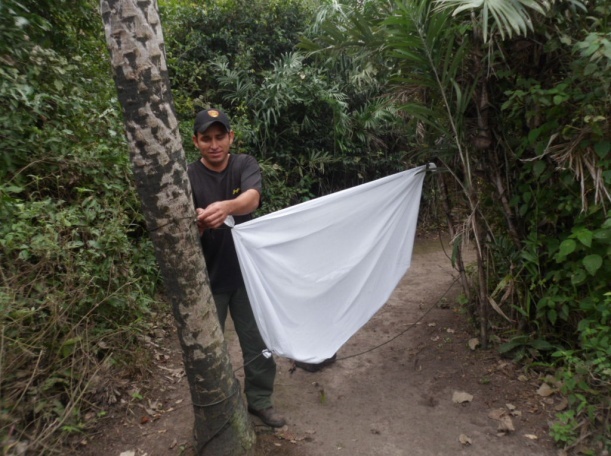 Edenilson Cabañas used to be a fisherman, but several years ago he started working in conservation. He’s been a ranger at the station for three years now, helping with maintenance, weather monitoring and hospitality (providing transport and assistance to tourists). He is also involved in biological monitoring and patrolling. Saúl Arias is the youngest of the three rangers. At the age of nine Saúl became a conservation volunteer for Eco Club Pantanal Paraguayo, which is supported by Guyra Paraguay. At the EcoClub Saúl took part in the Neotropical Waterbird Census and in radio programmes relating to environmental care, finally becoming the group leader. He is also member of the Paraguayan Bat Conservation Programme. At the Three Giants Saúl collaborates with biological monitoring, general maintenance of the station as well as tourist reception. His passion for photography has made an important contribution to species recording on the reserve. Inés at Three Giants. © Guyra Paraguay. Inés Balbuena comes from the Ishir indigenous community, whose traditional home is the land that is now protected by the Chaco-Pantanal Reserve. She has been working at the Three Giants since 2009 as the main housekeeper, and visitors enjoy her delicious cooking. She also helps with wildlife monitoring and research projects. Three Giants Biological Station opened in 2007 thanks to funding mainly from WLT Council Member, Kevin Cox. Named after the ‘three giants’ that are known to be present in the reserve – Giant Anteater (Myrmecophaga tridactyla), Giant Armadillo (Priodontes maximus) and Giant Otter (Pteronura brasiliensis), the station is a focal point for monitoring and research, as well as providing visitor accommodation. In 2013, rangers at the Three Giants developed a new trail named Tatu Carreta (Giant Armadillo). Some 1,042 metres in length, the new trail expands the station’s research area as well as offering new possibilities for camera-traps. Tracks of Lowland Tapir (Tapirus terrestris) and Jaguar (Panthera onca) footprints have already been recorded along the trail. Open to the public, the route also provides visitor access to more of the reserve’s natural attractions. WLT supports conservation efforts in the Chaco-Pantanal of Paraguay with funding from the Keepers of the Wild appeal. Please help keep wildlife safe at Three Giants by making a donation to Keepers of the Wild.